Pursue Excellence, Success will pursue you! Got a strong flavor of this with the cup of coffee at AI Foundry. Umakant and Neeraj – have targeted a niche position. AI Foundry is building incubation expertise for AI startups with focus on talent, data, domain and research. In addition to a global AI ecosystem (specifically, Toronto and Stockholm – and expanding to USA shortly), they are given $200 k for 5-25% equity. The world has seen multiple stochastic economic waves – the industrial revolution of 19th century held sway …and was followed by the digital (IT/ IT Services) wave…AI could well be the tsunami game-changer. AI itself is seeing multiple transitions. From original algorithm intensive statistics led AI systems, we have seen the evolution of deep learning in the 2010-2020 period. The next decade will be the evolution of common sense AI but the experts are forecasting that there will be a 4th wave of AI. This last wave will have a form that will be shaped by technologies that emerge over the next couple of decades …and could transform, deliver next level of fulfillment for the denizens of the future! What will the companies of tomorrow look like? What will be their business model? 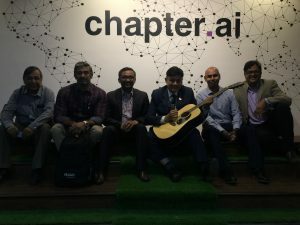 What will it take for India to capture its opportunity in the AI wave? China and USA are leading the AI wave – can India monetize its massive data repositories? I think AI Foundry is on the right track – which is why they are seeing an interest from some of India’s biggest corporations.